Among the items on the muddled list of Ferdinand Marcos’ supposed achievements was a piece of legislation he signed into a decree in 1974. Enacted aptly on May 1, 1974, Marcos put in place a Labor Code to promote overseas contract work. Many have regarded this as a milestone as it was the first time that the government turned the spotlight on labor. Some said it was the new Magna Carta secured by the Filipino working class. But roughly four decades later, it has become nothing but a reference to another discordant topic that hounds the country. If we look at the numbers, they would say that there was indeed an upshot. From 1975 through 1986, the 36,035 workers deployed swelled to 266,243. That’s a whopping 949-percent increase. But experts note that such numbers should be taken with the fitting footnotes. “That time, labor export was a response to the demand for workers in the Middle East, given the boom of the oil sector,” said Jeremaiah Opiniano, executive director for Institute for Migration and Development Issues. And while the ’74 Labor Code was a stellar piece of legislation on its own, it also served as a political tool. 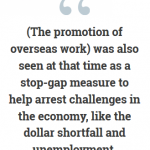 “It was also seen at that time as a stop-gap measure to help arrest challenges in the economy, like the dollar shortfall and unemployment,” Opiniano chimed in. 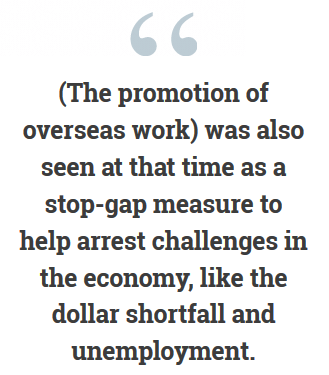 Data-crunching whiz Jan Carlo Punongbayan, who served both the World Bank and National Economic and Development Authority, noted in a study that “dissatisfaction in the labor force” was among the key factors for underemployment. The spike in underemployment, which Punongbayan noted to have peaked during the ’70s and ’80s, would later greatly influence the Philippines’ labor export. And the upshot? The ever-growing number of Filipinos seeking opportunities far from the motherland. Linda Cervales may have not shouldered the burden of becoming an OFW during those tumultuous times, but the residual effects haunted her. Now 49 years old, she recalled struggling to land a job due to being a former activist. “Takot ‘yung mga big companies to hire PUPians, so medyo discriminated na kami,” she shared. “I tried applying sa banks, since banking and finance student ako. I passed the exam pero pagdating sa final interview, they gave the position sa mga graduates from exclusive schools. “I ended up working for a multinational company but the job is not related to my course, so underemployed na ako nun,” Cervales added. The series of setbacks forced Cervales to make the seemingly inevitable course of action. She went on to work in Taiwan and eventually, Dubai.